I live a short drive away from the birthplace of the shale oil revolution. It was 2006 that we started to get an inkling that something big might be happening. My business has always been finance, so I wasn’t directly involved. However, the people around me very much were. I watched twenty-five year olds blow through hefty six-figure salaries as fast as the money came in. Then I watched them scramble to keep their houses when oil prices crashed in 2014. For years now I’ve been surrounded by oil industry families wherever I go. My gym, the grocery store, at my kid’s school. Everywhere I go, interacting regularly with oil patch workers is part of my daily life. Nice people for the most part, if a little rough around the edges. It has been hard to watch them go through the bust that followed the really good times that were driven by $100 oil. What I’ve learned through my interactions is that these oil industry folks share some very passionate opinions. Not surprisingly those opinions are directly aligned with what is in the best interests of their industry. If you are wondering what I mean, let’s just say that the strong majority of them drive giant gas guzzling trucks or SUVs, don’t own a copy of Al Gore’s Inconvenient Truth, and probably don’t live in a neighborhood with solar panel rooftops. 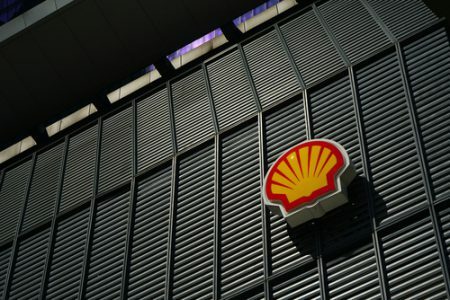 And it’s my familiarity with the loyalty these people have to their industry that made the remarks from the mouth of Royal Dutch Shell’s CEO even more surprising. I’m pretty sure that when I look back on today ten years from now, those words from Shell’s CEO Ben Van Beurden will be a critical point in time that I remember. That will be the moment when I realized that the electric car revolution is truly underway. Shell’s CEO said none of those things. What he said told me that the age of the electric car is underway. That means that the growth curve for electric car use is about to go parabolic. Seriously, I mean parabolic. I want you to fully appreciate how crazy the numbers here really are. 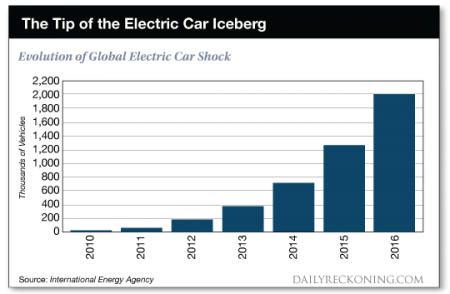 The chart below from International Energy Agency data shows the impressive growth that the electric car has had since 2010. We have gone from virtually zero electric cars on the road to just over 2 million in 2016.